Velugu initiates programmes on a regular basis to mitigate the sufferings of the rural public due to lack of infrastructure such as roads and drains. A sister activity is infrastructure for water conservation in this arid region. By raising awareness and mobilising the support of rural women, Velugu hopes fundamental changes will take place in the district. Velugu has helped rural women form 42 viable groups which meet twice a month. Velugu staff attends their meetings. They are made aware about savings, how to generate income from locally available resources, the importance of protecting environment and natural resources. 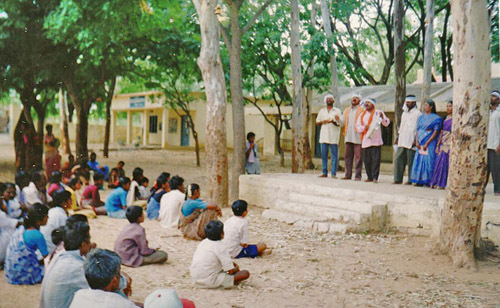 All the members actively participate in community development. The members are informed about various Government schemes and procedures to avail of benefits. All these are helping the members to develop and progress in a steady manner.